The gratitude on my husband’s face when I brought a small tin of these Chocolate Chip Rugelach up to his office this week was all the validation I needed. They’re among his favorite cookies and this was the first time I’d ever made them. The recipe is a little bit different from many I’ve seen – it uses a prepared chocolate filling rather than nuts, jam or other traditional fillings – but the end result was delightful nonetheless. With tonight being the first night of Hanukkah, I thought I’d share the recipe with you. I’d never heard of anything called “chocolate filling” until the Love’n Bake company sent me some to try. It came in a can and kind of reminded me of chocolate frosting, but with thicker consistency and more intense chocolate flavor. 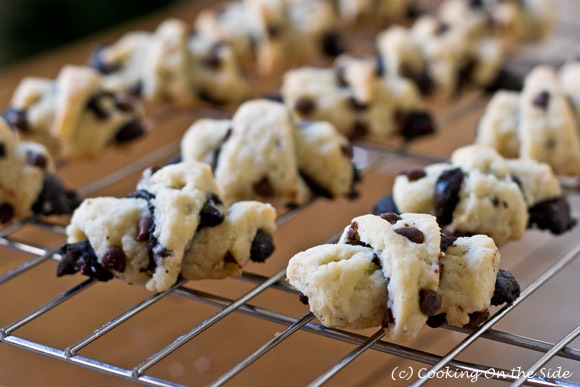 There was a recipe for Chocolate Rugelach inside the wrapper, so I decided to give it a try for the blog, adding mini chocolate chips to the cream cheese dough as I’d recently seen done at a local bakery. 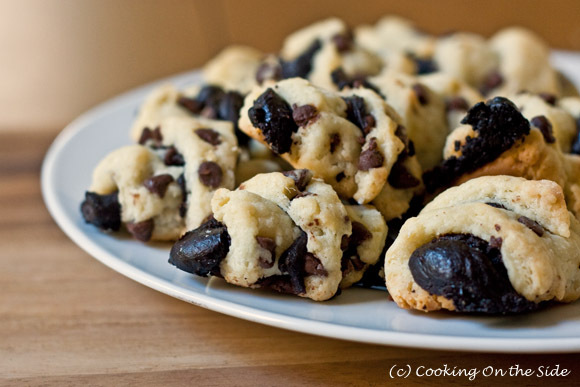 In lieu of glaze, as some rugelach recipes call for, the chocolate chips added a nice amount of sweetness to the otherwise rich, but unsweetened, dough. Once baked, the chocolate filling took on an almost chewy feel which I really liked. Using the chocolate filling made making these rugelach rather easy – you can find it at Sur La Table stores and on Amazon . For a more traditional approach to making rugelach, you also might take a look at the tips and recipe from Dorie Greenspan (I love everything she bakes!). Place the flour, salt, cream cheese and butter in the bowl of a food processor with a metal blade. Process until a smooth dough forms, about 10 to 20 seconds. Wrap dough in plastic and chill at least 1 hour before using. Divide the dough into 4 pieces. On a lightly floured surface, roll one piece of dough into a 9-inch circle about 1/8-inch thick. As you’re rolling, sprinkle in about 1/4 of the mini chocolate chips so that they are incorporated into the dough. With a pastry cutter, cut dough into 16 pie-shaped wedges. Spread a scant teaspoon of chocolate filling on each dough wedge. Roll the dough up starting from the wide end. Place on an ungreased baking sheet. Repeat with the remaining dough. Bake in a preheated 350°F oven until golden brown, about 20 minutes. Cool on wire racks. This looks awesome and is making me sooo hungry!!!!! I love your chocolate chip version. Bookmarking this recipe! .-= Maria´s last blog ..The Best Christmas Cookie Recipes =-. I love Rugelach, especially around the holidays! I don’t think I’ve ever had ths chocolate version but it looks delicious! .-= Cookie´s last blog ..Early Birthday Dinner for my Honey! =-. I have a doubt.. since the cookie dough has cream cheese, I was wondering.. how many days this cookies can stand? well.. congratulations for this wonderful blog! I am someone that really likes to cook, so I am constantly trying to find out some new recipes to make with my own hands. These cookies, judging by the pictures, must be delicious, and the recipe doesn’t look complicated at all to follow. I found that chocolate filling pretty interesting and useful. How well do you think something like Nutella would substitute for the chocolate filling? Hmmm…interesting thought. It might be worth a try just to see. I’m wondering whether the Nutella might melt down a little too much. Would love to hear how it works if you try it! Great recipe! Didn’t have a mixer, so I mixed it by hand. Worked out well! Also, used nutella inside, yum!! Nutella sounds like a great idea!